We know our customers love vintage Gibson guitars and earlier this year we told you about an exciting new partnership between JGG and Factory Street Studios (Bradford, UK) for the production of vintage guitar video demonstrations. We are therefore very happy to announce that we have just completed another round of video demos and once again we have employed the amazing guitar skills of UK jazz guitarist Jamie Holroyd. 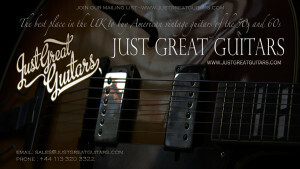 We got Jamie to work with some of our finest vintage Gibson guitars and especially our stunning collection of ES-175s. This time we also asked Jamie to feature some of our excellent vintage Fender amplifiers alongside the guitars and we think you’ll agree that the combination has produced some fabulous results! There’s really nothing quite like plugging a great vintage Gibson guitar into a small Fender tube amp combo. All those rich vintage tones just explode from the speakers and it’s all topped off with some real spring reverb giving you vintage guitar tone heaven. Here’s a couple of sample video clips for you. Btw – If you haven’t already, please do visit our dedicated JGG video channel on YouTube and subscribe to keep up to date with all our new videos as they are posted. You will be seeing a lot more of Jamie and our guitars in the coming months.